Austin’s first alt school tour! 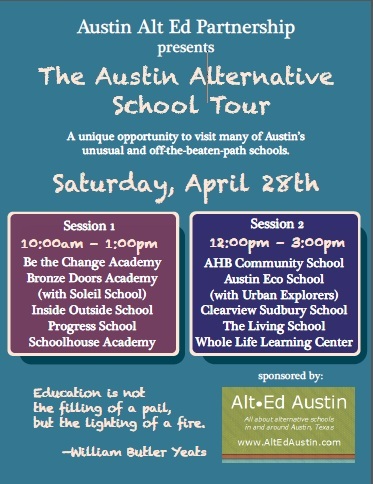 I am pleased to announce the inaugural Austin Alternative School Tour. In the great Austin tradition of simultaneous, coordinated open houses (like the very hip East Austin Studio Tour, the very green Austin Cool House Tour, and this weekend’s very yummy East Austin Urban Farm Tour), ten of the area’s best small schools will welcome visitors on Saturday, April 28, to learn firsthand about their very innovative and successful programs. The tour is free! It’s open to both adults and kids, and no reservations are needed. Just grab a schedule and tour map, and stop by as many participating schools as you can. You’ll get to meet some brilliant educators, tour their beautiful and unique learning environments, talk with other parents and school community members, and come away with some new ideas about where your child might best learn and flourish. 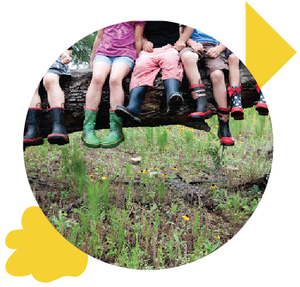 The tour is presented and coordinated by the newly formed Austin Alt Ed Partnership, an all-volunteer initiative that’s bringing together Central Texas educators to foster and develop alternative education. You’ll be hearing more about this organization here on the blog in coming months. In the meantime, I’m proud to call Alt Ed Austin a sponsor of this exciting event. As a lead-up to the tour, many of the participating schools, along with several others, will be celebrating Earth Day by hosting children’s activities at two public events. On Saturday, April 21, they'll have a special presence at the Downtown Farmers’ Market alongside other Earth-friendly organizations. And on Sunday the 22nd, you'll find them in the Kids’ Area of the Austin Earth Day Festival at Mueller. At both events, you and your kids can have fun making seed balls to take home, talk to alternative educators about their programs, and pick up brochures for many different schools. They’ll also be distributing flyers for the April 28 alt school tour, complete with maps and schedules. If you don’t make it to either of the Earth Day weekend events (or even if you do), you can download and print the tour information right here. Please share it with other parents you know who are looking for the right schools for their kids. I look forward to meeting you on the tour!